The smell of smoking brisket and homemade barbecue sauce is one of my favorite smells in the world and given that our sense of smell is tied so closely to my memory, it’s no wonder I have so many wonderful memories of cooking. 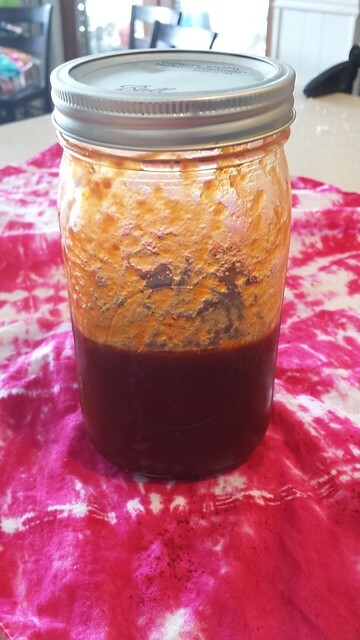 If you’ve never made your own sauce, give it a try – it’s not very hard and it tastes a million times better than what you could purchase at a store. We’re hoping to try some new varieties this summer (I’ve grown some awesome peppers in my garden, so a spicy version is on tap for the near future). This makes about a quart of BBQ sauce, enough to serve and have plenty left to keep in the refrigerator. It you reduce it enough it fits perfectly in a large mason jar. 1. Mince the garlic. Heat the oil in a saucepan over medium-high heat. Add the garlic and cook for about a minute, until fragrant. 2. Add the other ingredients, stir, and allow the mixture to come to a boil. When it does, turn the heat to low, and allow the mixture to simmer and reduce for 20-30 minutes. Taste and add salt and pepper as needed.